What’s New May 4th, 2019 Staged Reading of THE MONROE DOCTRINE!! May 4th, 2019 Staged Reading of THE MONROE DOCTRINE!! 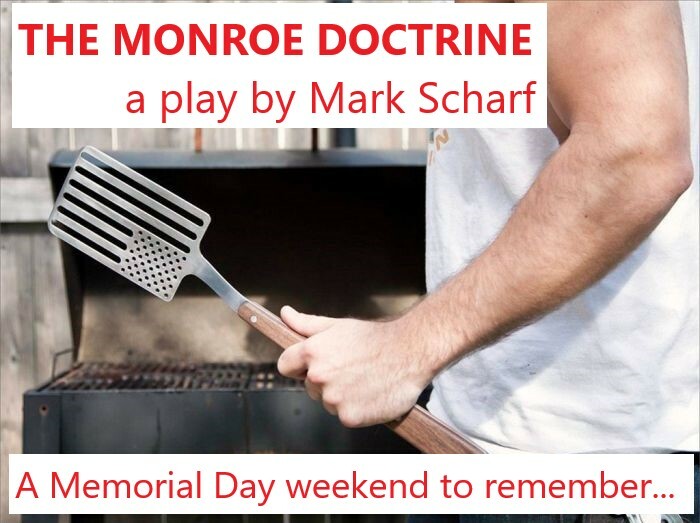 Coming May 4th — a staged reading of Mark’s new full-length play, THE MONROE DOCTRINE!! Saturday, May 4th: Reading at 8 p.m. followed by a reception. What does success mean in America? What does it mean when you don’t make it? In THE MONROE DOCTRINE, poet and adjunct professor REAL MONROE tries to hold his world together from his trailer on Hog Island on Maryland’s eastern shore. Its’s Memorial Day weekend and the men of the family gather for what may be the last time to meet the wishes of Real’s Korean War veteran father, an assisted living facility refugee. When Real’s estranged sons arrive, expectations and reality collide and even the students he has tried to help leave him scrambling for solid ground in a shifting landscape of obligations and power. The play can be thought of as an elegy to the lost place of the artist in the world and to twentieth century versions of masculinity, the ideal now which is ever changing like a shape shifter with amnesia. Mark has been working on this play since completing the first draft in 2015 – this staged reading is the first time that the play will be read by actors in a directed staged reading before an audience.